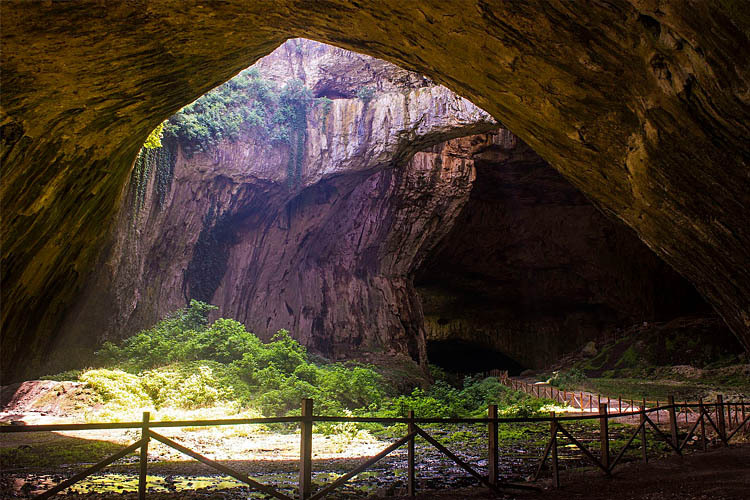 Located seven kilometres from Letnitsa and 15 kilometres northeast of Lovech, near the Bulgarian village of Devetaki, is the gigantic, mysterious and generally extraordinary Devetashka Cave. The cave itself is immense, measuring roughly two kilometres in length with a huge entrance chamber some 60 metres in height. 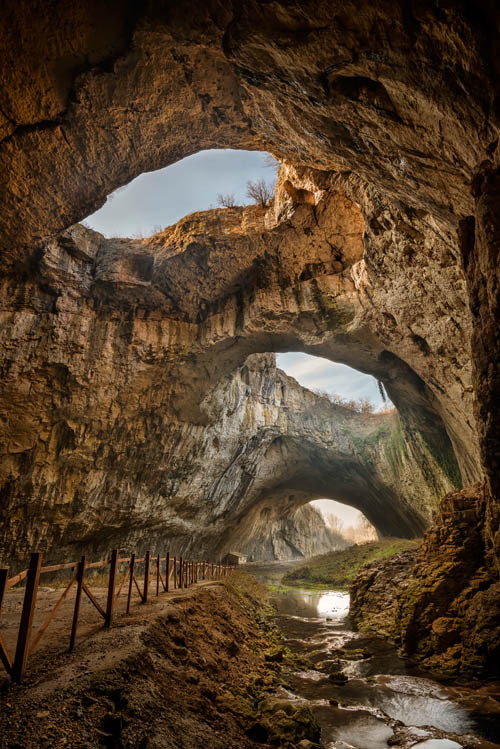 The roof of Devetashka Cave is as high as 100 metres in places and is punctured by seven large skylights allowing natural light to illuminate the interior. These holes are known locally as Maarata or Oknata and translate as “The Eyes”. Devetashka Cave showing the stream and karst pools. Click image to enlarge. This unique cave offered an ideal environment for early humans providing shelter, running water, space and light. It’s not surprising then that archaeologists have discovered that people have lived here for around 70,000 years. Excavations have revealed that Devetashka Cave is one of the richest sources of Neolithic (6th millennium – 4th millennium BC) cultural artefacts in the world. Devetashka Cave is no longer home to humans but is still used by a wide variety of animals including many that are listed as endangered. For this reason the cave is completely closed to visitors during June and July which is the breeding season for mammals in the region including some 30,000 bats that call it home. In fact, there are thirty-four species of mammals, twelve species of protected amphibians and eighty-two species of bird found in the immediate region. During the 1950s, when Bulgaria was part of the Soviet Eastern Bloc, the cave was used as a storage depot for petrol and food. According to some researchers, the cave later became a secret base before being decommissioned. Some remnants of the base can still be seen including the railway path, ruined bridge and concrete bases that supported the oil tanks. In June, 1996, Devetashka Cave was declared a natural landmark. The cave really came to the attention of world when it was selected as a film location for the 2011 action movie ‘The Expendables 2’. In the movie Sylvester Stallone crash lands an aircraft into Devetashka Cave which, ironically, is Jean Claude Van Damme’s secret underground base. Devetashka cave at the moment the sunrays touch its center. Previous ArticleIs a Zombie Apocalypse Really Possible?